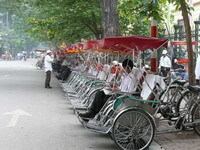 While slowly being supplanted by motorbikes, cyclo pedicabs still roam the streets of Vietnam's cities and towns. They are especially common in scenic smaller, less busy cities like Hue, where it's pleasant to cruise slowly along taking in the sights. Though the ride will be slow, hot and sometimes dangerous, you'll generally need to pay more than for a motorbike for the equivalent distance. On the plus side, some drivers (particularly in the South) are very friendly and happy to give you a running commentary on the sights. Cyclo drivers are notoriously mercenary and will always ask for a high price to start with. Sometimes they will also demand more than the agreed price at the end. (Japanese tourists, especially women, are most often targeted with this scam since they are more responsive to the threat that the driver will call the police and make trouble for them if they don't pay as demanded) A reasonable price is about 20,000 dong for up to 2 km, and if the driver disagrees, simply walk away. (You won't get far before that driver or another takes your offer) Prices for a sight-seeing circuit with intermediate stops are more complex to negotiate and more subject to conflict at the end. If you plan to stop somewhere for any length of time, it's best to settle up with the driver, make no promises, and start fresh later. To avoid trouble, it's also best to have exact change for the amount you agreed to pay, so if the driver tries to revise the deal, you can just lay your cash on the seat and leave.